The children roll clay slabs to construct houses. For ages 9 to 13. Plan 6 sessions. 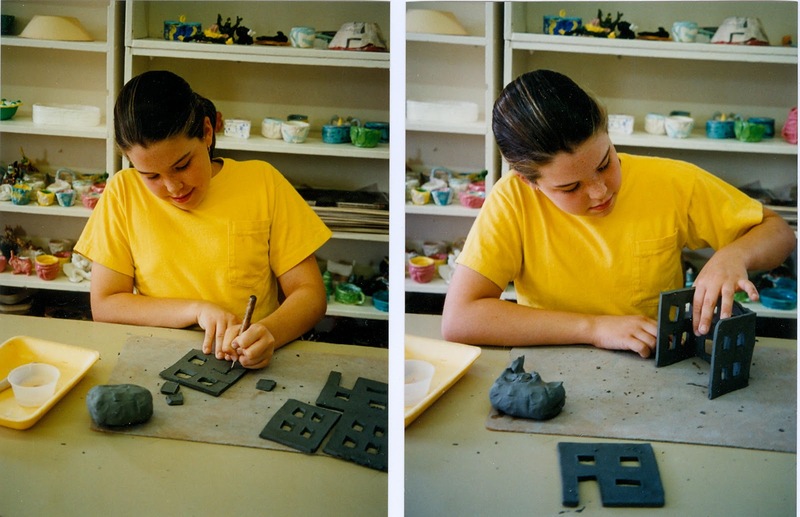 Click here to view additional information about working with clay. Wedge the clay into grapefruit-size balls, planning two per child plus a few extra. Set out clay balls, rolling pins, guide sticks, needle tools, and containers of slip or water. 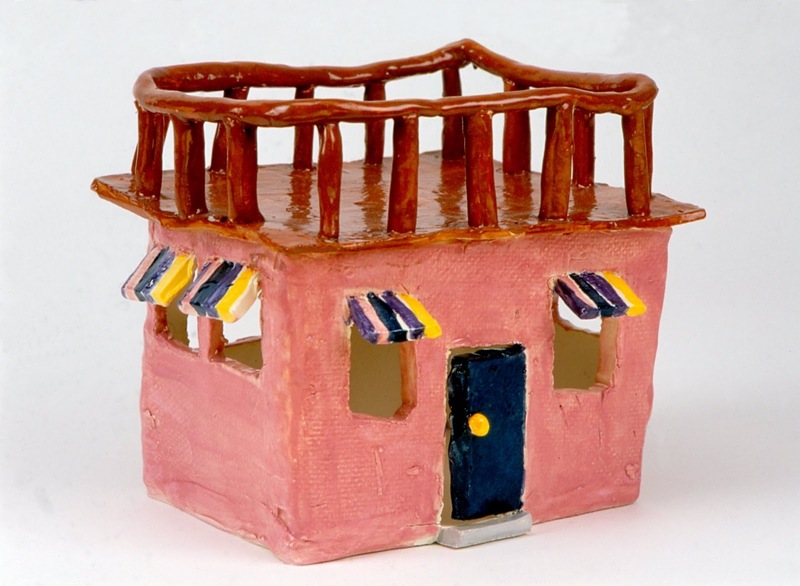 Discuss the architecture, or structure of houses, including elements such as porches, garages, chimneys, etc. Encourage the children to observe the houses they see while riding in a car or walking in their neighborhoods. Explain that over the next several sessions they will be constructing clay houses. In this session, the children will be making slabs, or flat pieces of clay, and cutting out the walls for their houses. Demonstrate how to make a slab. Place two guide stick on the sides of a ball of clay. Be sure they are positioned so that the rolling pin will ride on both sticks. Starting from the center of the ball of clay, roll away from yourself with enough pressure to begin flattening the clay. Roll only to the edge of the clay. Lift the rolling pin and return to the center. Roll towards yourself using the same pressure. Repeat these steps, gradually increasing the pressure until the rolling pin rides directly on the guide sticks. As you work, turn the slab over several times to avoid having it stick to the board. Several slabs may be needed for each house, depending on the size. Show the children how to cut the walls for a house from the rolled slab using a needle tool. Smaller houses are more manageable, so the walls should not exceed five inches in any direction. For a rectangular house, plan two equal-sized walls for the front and back of the house and two equal-sized walls for the sides of the house. Distribute the clay. Have the children role slabs and cut out the four walls for their houses. If time permits, they should also cut the walls for additions, such as garages and porches. Have each child stack his or her wall slabs in a pile with the larger pieces on the bottom. All of the slabs must be stored flat to prevent warping. Be sure they are marked with the child’s name. Note: Let the cut slabs dry until they are just hard enough to stand without sagging. Then cover them very tightly with plastic wrap. Leftover clay can be reused by wetting and wedging it again. Wedge the clay into grapefruit-size balls, planning one per child plus a few extra. Set out the clay balls, needle tools, containers of slip or water, and the walls slabs from the previous session. In this session the children will be rolling slabs for the roofs; cutting windows into the walls; and attaching the walls. Explain that leather-hard or partially dried clay can no longer be bent without breaking; it can only be changed by cutting it or adding to it. Using a needle tool, show the children how to cut the windows. To keep the walls strong, don't cut the windows too close to the edge of the slab. Demonstrate how to attach the walls of the house by using the scratch and slip process (scratching the surfaces to be joined, applying a small amount of slip or water, and pressing the two pieces together). Explain that it is important to do this carefully because as slabs dry they tend to pull apart. 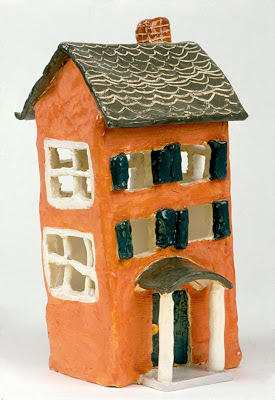 To make an even stronger bond, roll a very thin coil of clay and meld it along the inside joints where the walls meet. Each child should first roll a slab large enough for the roof of his or her house and set it aside to become leather-hard for the next session. Then have the children cut out the windows and join the wall slabs together. Note: Cover the houses and slabs for the roofs tightly with plastic wrap to keep them leather-hard. Wedge the clay into smaller orange-size balls, planning one per child. Set out houses and slabs for the roofs. Explain that in this session the children will be attaching the roofs to their houses. Remind them that leather-hard clay is breakable and must be handled carefully. Explain that house roofs can be either flat or slanted. For a flat roof, place the house upside down on the slab and cut around the edges, adding about a quarter-inch on all sides. Scratch and slip the roof to the top of the house. For a slanted roof, two sides of the house need to be heightened with triangles to support it. Cut the triangles from the slab and attach them to the sides of the house. Then cut and attach the roof slabs. 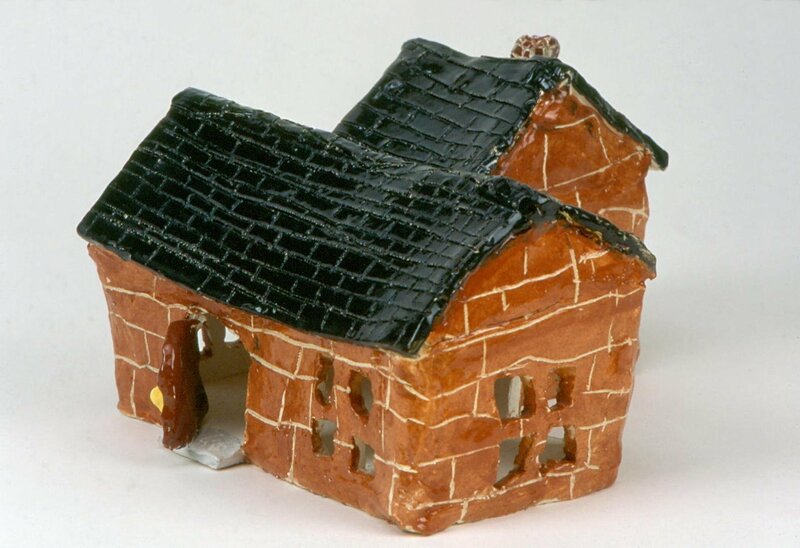 After the children decide on flat or slanted roofs, have them cut their roofs slabs and attach them to the houses. If the children have extra time after attaching their roofs, they can begin to make additions, such as shutters, doors, and chimneys. Remind them to scratch and slip all additions. Note: It’s important to keep the houses leather-hard for the next two sessions. If necessary, place a slightly dampened paper towel over each house before wrapping them tightly in plastic. Set out the clay balls, needle tools, containers of slip or water, and the houses. Explain that in this session the children will complete the construction of their houses by adding floors and details, such as doors, doorknobs, shutters, chimneys, and front steps. Remind the children that leather-hard clay needs to be handled very carefully. Demonstrate how to make a floor for a house. Roll a slab, place the house on the slab and trace around it with a needle tool. Remove the house and cut out the floor. Scratch and slip along the edges of the floor and place the house on top. It’s not necessary to scratch and slip the bottom of the house, since it will be resting on the floor. Carefully smooth along the edges. After the children roll their slabs and attach the floors of their houses, they can begin to add details, such as shutters, doors, door knobs, front steps, etc. Remind them that they must scratch and slip all additions. Note: To keep the houses leather-hard, place slightly dampened paper towels on them before wrapping them tightly in plastic. Set out underglazes, brushes, and needle tools. Explain to the children that they will be applying color to their houses and adding textures such as bricks or roof tiles. Remind them that the houses are breakable and need to be handled very carefully. 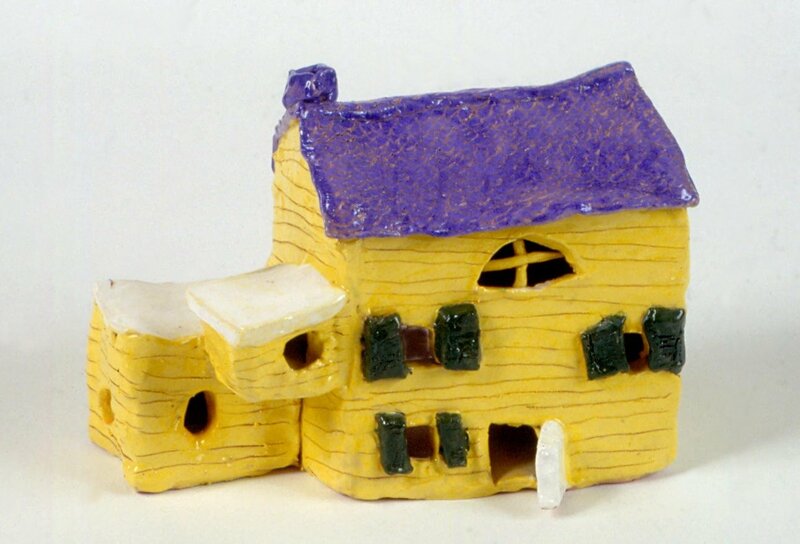 Show the children how to apply underglaze or color to the houses. After the first coat is applied, add a second coat. 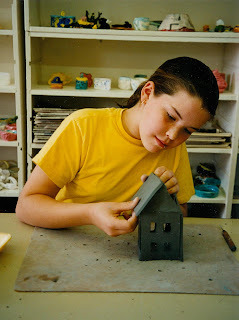 Using needle tools, scratch in designs such as shingles on the roofs, bricks on the chimneys, or siding on the walls. Explain that the areas where the underglaze has been removed will become the color of the clay after the houses are fired in a kiln. Have the children apply two coats of underglaze to their houses and add textures and designs using the needle tools. Note: Slowly dry the houses by gradually loosening the plastic wrap. If dried too quickly, the slabs might pull apart. When completely dried, bisque-fire them in a kiln. 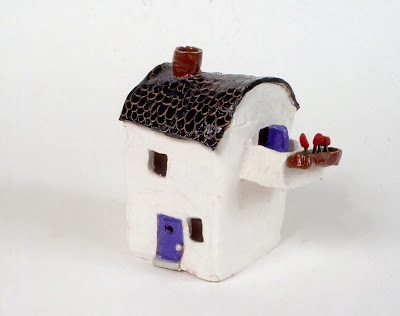 Explain to the children that the houses have been fired in the kiln and are now referred to as bisque. A clear glaze is applied to the bisque to give it a strong surface. The glaze will cover up the underglaze colors temporarily. 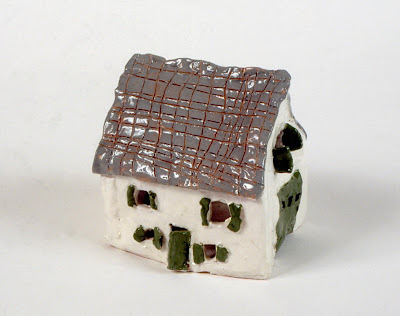 When the clay is fired in the kiln again, the glaze will melt and turn clear, allowing the colors to show. To avoid putting on too much clear glaze, which will cause the colors to become cloudy after firing, be sure the children understand that when the glaze is first applied it will look transparent. As it dries, it becomes opaque. The number of coats needed varies according to the glaze instructions, but usually one or two coats are sufficient. Have the children apply the glaze to the outsides of the houses. 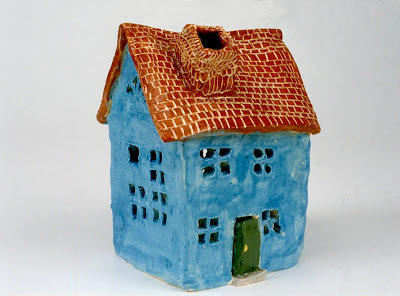 Note: After the houses dry, glaze-fire them in a kiln. The children should have some experience working with clay slabs before doing this project. Continually remind the children that leather-hard clay and bisque are very fragile. If the houses become too large, they are harder to handle and take longer to complete. Keeping the houses smaller will allow for more time to include details. These houses are very charming when illuminated. While still leather-hard, cut a hole in the back of the house large enough for a small Christmas bulb to fit through, allowing for ten percent shrinkage after being fired in a kiln. A string of Christmas tree lights works well to illuminate a row of houses. For an individual house, you can make a single light by purchasing a piece of 18/2 lamp wire, a male plug, and a small socket from a hardware store. 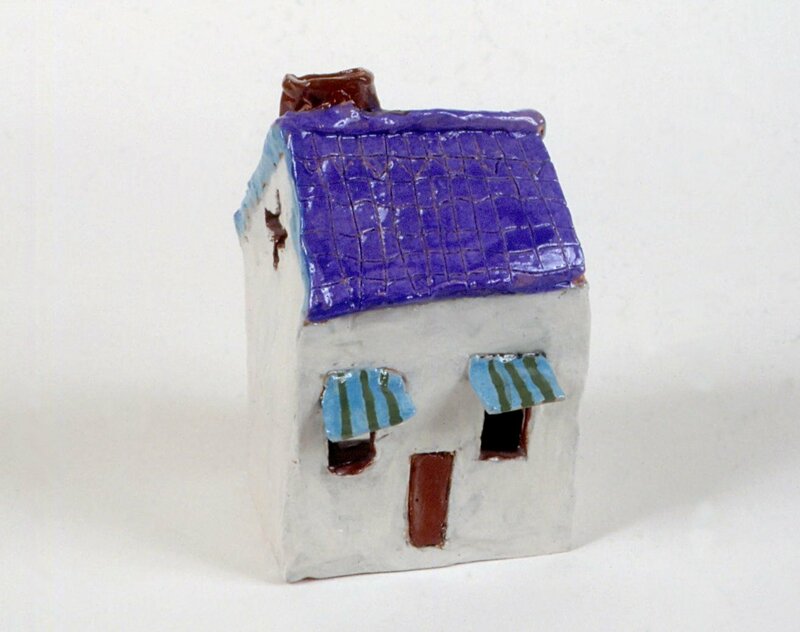 Designs, such as roof tiles, can be scratched into the leather-hard clay and then the underglaze can be applied after the clay is bisque-fired. This will create more of a textural effect rather than showing the drawn lines. Are all of the slabs firmly attached to make sturdy houses? My slab has stuck to the board. On no! I bent my wall slab and it broke! I want the door to my house to be open. The chimney on my roof is sticking out sideways. Once the clay becomes leather-hard, you can't change its shape by bending it. It can be repaired by scratching and slipping the broken pieces together and wrapping a damp paper towel around it. You can leave the door to your house open by cutting it out and reattaching it on one side of the doorway. If your roof is sagging, your slab is not dry enough. Perhaps we can support it with some wadded newspaper inside of your house which will burn off in the kiln. To attach a chimney to a slanted roof, you will need to cut the bottom of the chimney in a slant as well. Click here to view this lesson in printer-friendly format.